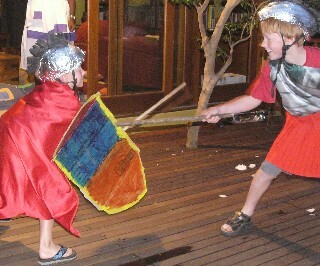 Homeschool History comes alive - Study Ancient Rome! History Project Ideas - fun things to make and do! This page is an overview of how you can create your own unit study or homeschool history Curriculum on Ancient Rome. Since this is the overview page, it is important to answer some questions before you begin. This will help you decide what path you may choose to take. There are some excellent Spine books you could use to study Ancient Rome. Some are: Story of the World, Story of the Romans, Diana Waring's Ancient Civilizations, Famous Men of Rome or Mystery of History. Many of these allow you to pursue your studies further by the use of art and crafts/ writings/plays/ Hands-on history projects, but you can also use the text as is, to give your family a taste of the time period. 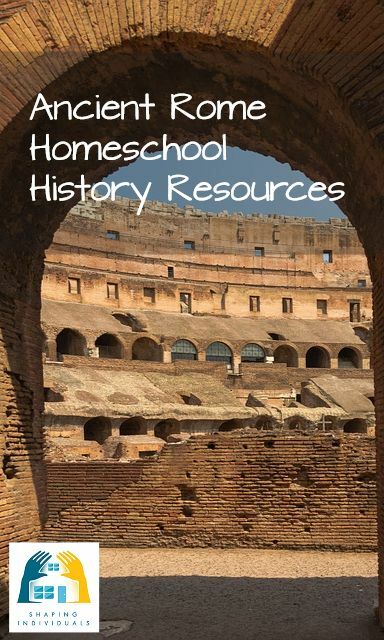 Using a spinebook is one of the ways you can approach homeschool history. More about Curriculum and Spinebooks for Ancient Rome here. Ancient Rome Living Books Curriculum Ideas here. For older children (years 10-12) you may encourage them to read some historical sources from this time period. Of course, as in all cases, you as parents are the judges of what will be beneficial to their understanding. However, you may decide to have history as the basis of all your studies. Your writings will spring from your studies in homeschool history; In art, you will study the artists of the time period - copy them, or produce crafts around the study; And of course - do the best history project ideas! In Geography, you will identify landforms, rivers, mountains, capitals and so on. You can do this by just having an atlas with you during your reading, stopping and pointing it out. Making a salt map is a great idea too. Often during our read aloud times, my children would draw or colour in a map while I read. In Science, you will study the scientists who were active in that time period. There are Curricula which helps you accomplish an integrated study of the time period. Many people choose to use Tapestry of Grace - which is a truly integrated approach, which we have loved using for years. Sonlight is also a comprehensive curriculum which covers many subjects in an integrated approach. Another way of studying the culture is to focus on where the civilization is spiritually. TruthQuest History is a study guide with book recommendations and a commentary to bring out these spiritual truths and consequences. TruthQuest studies the certain beliefs of a culture and shows how those beliefs are lived out by the people at that time and how the beliefs shape the actions and consequences of the people. We have also used TruthQuest History as a base of our history studies in our homeschool. It is very important that if and when we teach mythology, we do so in a Christian context. By this I mean, we teach the truth of Genesis first - as our base - as TRUTH; Then we explain, as we know from the Bible accounts, mankind turned their back on God and created gods in their own image, in the images of things above and the earth beneath, and in the waters below. When they did this they broke the first and second commandments. Reading myths with our children in a controlled environment (such as in your homeschooling family), helps them to gain a better understanding of the people of the time. If their gods behaved in certain ways, this set a standard for their own behaviour. As we read the myths together, it allows us to discuss false and true religion. Rather than shake the faith of our children, it can give confidence as they compare and discuss the absurdity of the gods with the true, faithful, loving God they know. Also, as we read myths we are laying a literary foundation for our children since many great works of literature refer to mythological characters as images and symbols. So, as we teach the history of a people, teaching mythology in a Christian context, will enrich our studies to understand the culture more and give our children the opportunity to see the foolishness of a false god and contrast truth against the false religions. Using the study guide to the Famous Men of Rome by Cyndy Shearer will help in guiding discussions not only of the myths but also all the famous men of Rome.